Janet Likes to Sew: Which sewing machine should I buy? For beginner sewers, this is my most frequently asked question. It is quite a dilemma! There are machines out there that sell for $100 and others that sell for thousands of dollars. Which brand, what features, new or second hand? Are they all the same? I have pretty clear views on sewing machines - what you need and don't need. The short answer to the big question is "get a Bernina machine". The long answer to the big question is "get a Bernina machine, and here is why you should…." I should also add here that I am not affiliated with Bernina in any way - I just love their machines. 1. A beginner sewer needs a machine that will be reliable and predictable. The last thing a beginner (or any of us!) needs is to have to battle with a cheaply made machine that has a poor quality stitch and is frequently jamming with tangled threads. You cannot be friends with a machine that fights you every step of the way! A quality built machine like a Bernina, doesn't have such issues, so you can be more productive and enjoy your sewing time. 2. You do not need a lot of bells and whistles on your machine. A lot of cheap brands try to entice you with various gadgets, but they usually comes at the expense of the build quality and more important features. The more important features, in my mind are: a range of needle positions (not just 2! ), a variable width zigzag, a solid pedal and a good range of quality feet. The vast majority of garment or home dec sewing will be done using a straight stitch, a zigzag and an overlock stitch, so you really don't need hundreds of decorative stitches. There are lots of ways to create decorative embellishments without having many stitch patterns. A basic Bernina machine has the same build quality as the top of the line model. They just add more stitches and features as you go up the line. This is not so for many other brands. The Bernina feet are well designed, stable and do their job very well. 3. You need a machine you can afford. Bernina machine are not cheap! Brand new machines start at $800 (AUD) so, what can you do if that is outside your budget? - get creative! Think outside the box! Got a birthday coming up? Ask for a combined birthday/Christmas/Mother's day gift from your family. Okay, so you still can't manage that sort of money? Whatever you do, please do not buy a $100- $200 machine! They are rubbish and will only let you down. Does your mum or grandma have a machine they aren't using anymore? Vintage machines are usually much better quality than cheap modern machines. This is a gorgeous vintage machine was owned by Megan's Grandma and it stitches beautifully! Janome does make a decent budget machine which is priced around $400 - the My Excel 18W. Some of my students have this machine and it is quite good. The bottom line is this: buy the best quality machine you can afford. If you have any questions about choosing a machine, please post a reply and I will help in any way I can. Ol' Faithful - an 830 - 40 years old and still sews like a dream! If you already have a machine, you aren't happy with it but cannot afford to upgrade there are some thing you can do to improve its performance. Stay tuned and I will post a blog on that subject soon! Labels: beginner machines, Bernina machines, vintage machines, which sewing machine to buy? Well said. I too hate cheap machines. You must be able to control your settings to get the best from your machine. What are 'lomain' machines like please? I am not familiar with that name. Perhaps you mean Lemair? If so, they are older style machines that are no longer produced. It would probably be worth keeping it. We can have a look at the machine as see what possibilities there are for your machine. Just let me know and we can tee up a time to suit. I completely agree regarding a good machine. 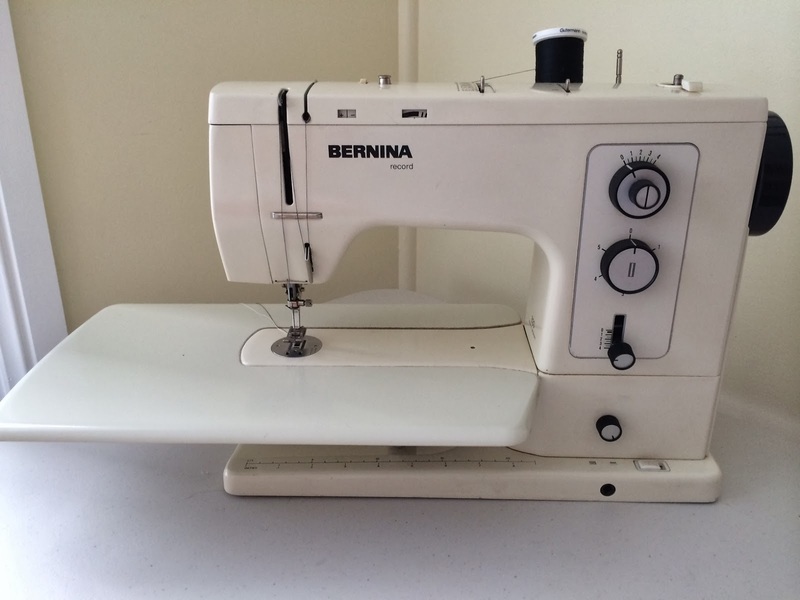 I am also a Bernina aficionado and own the second one after I could not get spare parts for the one I bought 40 years ago back in my home country of Switzerland. Very sensible advice all around! Hi! My name is Janet and I have been sewing since I was seven years old (some time ago!). I took needlework classes at high school and continued sewing for many years until (like many of you) my career took over and there was no time left for sewing. Fortunately for me, my dear Mum picked up the ball for me and I was still able to wear unique, well fitted clothes during those years. Eventually life slowed down enough that I was able to sew again and I’ve been enjoying my craft immensely since then. Over the years I have learnt many techniques both old and new that have made my sewing experience more enjoyable and productive. Late in 2010 I had my Eureka! moment and discovered what I REALLY wanted to do with my life. Teach people to sew! So, I started the Janet Likes To Sew sewing school based in the Sutherland Shire on the southern side of Sydney. Please accept my invitation to join me and learn a wonderful creative skill that will give you great joy and a wardrobe full of unique, beautiful and well fitting clothes.